Round Table Knights is an electronic swiss duo formed by Marc Hofweber (Dj Questionmark) and Christoph Haller (Dj Atomik). These guys met during a hip hop concert back in 2000 and have been experimenting with turntables ever since. Their sound is pretty unique; combining disco and funk elements with house basslines and latin beats they manage to create amazing pieces perfect for the dancefloor. Their two EP's "Cut to the Top" and "Calypso", released under Made To Play, have got them to share stage with artists like Soulwax, Justice, Crookers, Air, and gained them support from famous djs and musicians like Brodisnki, Annie Mac, Joe Goddard from Hot Chip, Shir Khan and many others. 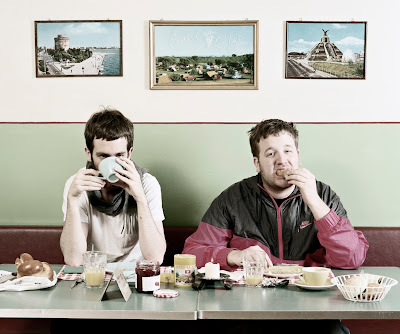 Their latest single Hold me Back has been widely supported by blogs and magazines worldwide and has mapped them on the electronic scene as a band on the look. Their music is refreshing and will definitely take them far. Get to know them with the amazing tracks below or buy their EPs here.